Appearing on MSNBC’s Hardball Friday, Rep. Eric Swalwell (D-CA) asserted President Donald Trump is an agent of the Russian government. CHRISTOPHER MATTHEWS: Let’s talk about the materiality [of BuzzFeed’s report] here. How material was this to the role of the president of the United States. To cover up a business deal, told one of his people to lie about it. Is that relevant to his role as head of state? Tell me how. 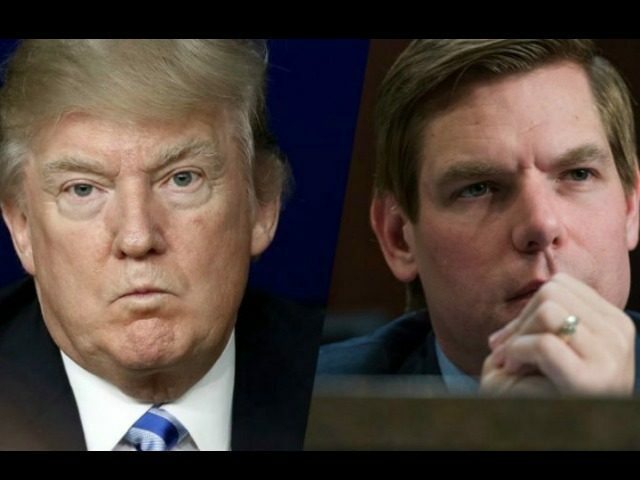 REP. ERIC SWALWELL: This is Watergate plus, right? Watergate was more of a domestic issue, rule of law at stake, the articles involved, contempt of Congress, obstruction of justice, and abuse of power. Here, if you step back and ask why did the president direct Michael Cohen to lie, if that’s what he did, it’s to cover up a relationship that he had with Russia that is still ongoing today. What we value: democracy, human rights, a rule of law, that’s at stake. So, that is an outside threat, as well as an inside rule of law threat. I think that is what’s most concerning to me. MATTHEWS: To me, it’s always been a question of collusion with the Russians, all kinds of weird entanglements, 101 that we’re counting right now between the Trump people and the Russian, and obstruction of justice. I wonder if it’s one of those cases where there’s an overlay, because if he was covering up his business dealings so he could cover up the fact that he was talking nice about Mr. Putin all those times to keep a business deal warm, that is a real problem in our country. REP. SWALWELL: Yes. That’s evidence of collusion There’s an entanglement with a country that is not our friend. I think some of the best evidence, if there’s a quid-pro-quo, the quo really started to heat up after the Helsinki conference, right? Since Helsinki, where the interpreters’ notes were essentially taken away, no other witnesses in the room, he has pulled us out of Syria, he’s tried to take us out of NATO, and he’s easing sanctions against someone who is involved in the Mueller investigation, Oleg Deripaska. MATTHEWS: You’re a member of the Judiciary, do you believe the president, right now, has been an agent of the Russians? REP. SWALWELL: Yes. I think all the arrows point in that direction, and I haven’t seen a single piece of evidence that he’s not. MATTHEWS: An agent like in the 1940s where you had people who were “Reds,” to use an old term, like that? In other words, working for a foreign power? REP. SWALWELL: He’s working on behalf of the Russians, yes.